Have you ever thought about how inaccurate that phrase is? The rainy day grays would be a better description in my opinion. Sitting at my computer this afternoon, I glance out the window above me, and what I see is gray, not blue. Gray is the color of rainy days, and a very accurate description for today. Two days ago, we celebrated a perfect, sunny-blue-sky day with the temperature topping out at 80 degrees Fahrenheit…our highest so far this spring. It seemed almost like summer, and a marvelous antidote to our long, snowy, and record-breaking frigid winter. A mere 48 hours later, we have plunged back into mid-March. That is to say: wet, chilly, overcast, and basically gray. A good friend needed a ride to a doctor appointment. Taking her there got me out of the house, and we thankfully escaped the worst of the wet weather…driving between the cloudbursts. While I waited for her to finish her appointment, I encountered another patient who was waiting for a ride home. My conversation with this amazing 94-year-young stranger warmed my heart. That’s a story for another day, but I just hope our conversation blessed her as much as it did me. Out of the blue (a much better description for today), another good friend called with the news that she had made a big pot of chicken rice soup and wanted to give me some…my second mood brightener of the day, and a very tasty lunch when I arrived back home. The third source of my joy was the birds that visited my back yard “bird buffet,” 10 different species in all, and I got decent pictures of eight of them. They seemed positively energized and delighted by the falling rain and new bird seed waiting for them at the buffet. 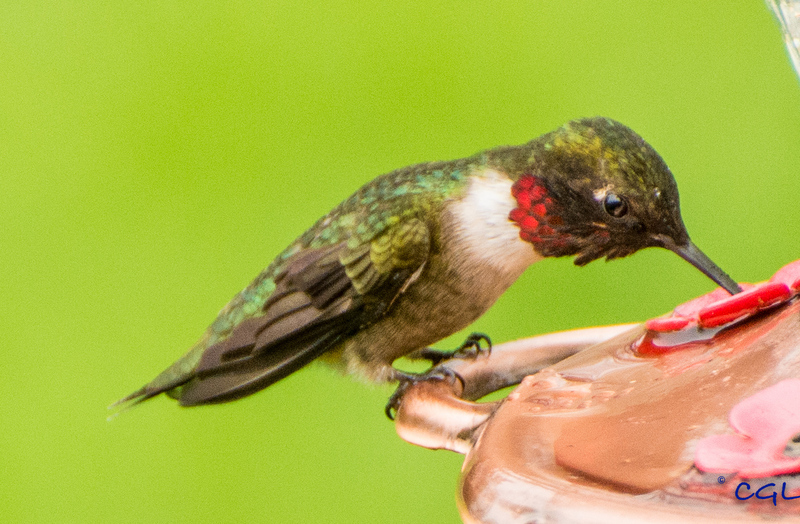 And to top it all, a hummingbird stopped by to sip fresh sugar water. 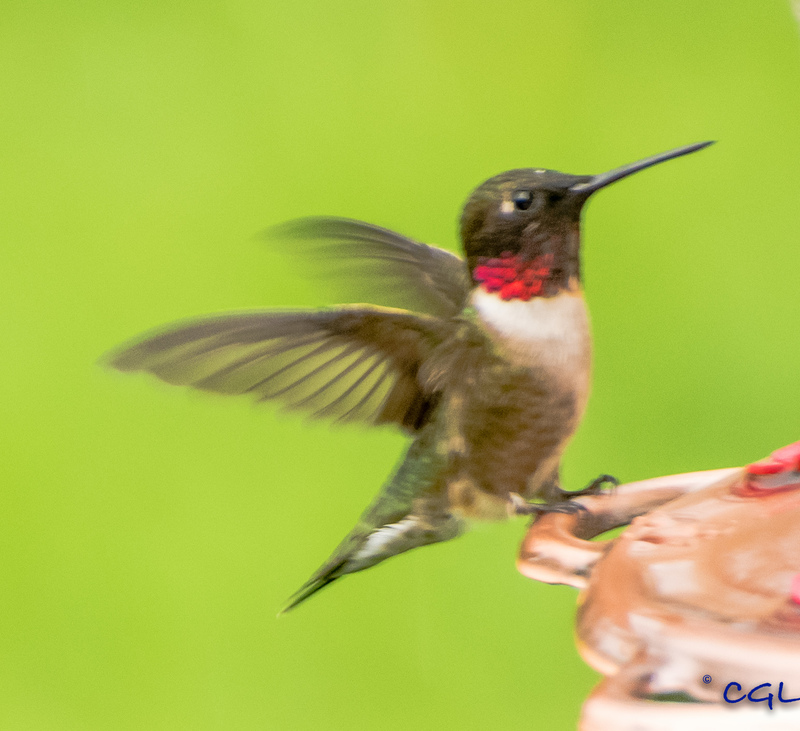 It’s our first hummer of the summer (forgive me for being a little silly, but hummingbirds have that effect on me). Here he is. Doesn’t he look happy? These are far from the sharpest hummingbird photos I’ve ever taken, but capturing tiny, quick-moving birds is one thing cloudy gray skies don’t do well. Exercise: No walk today. Too much rain and too little time! Weather: In a word, wet. Another word: cool. It has been a day full of blessings for which I am thankful. If you want to see the other bird buffet visitors, click here. They are posted on my nature blog.